TeamViewer is a popular application for remote control, desktop sharing, file transfer, online meetings and more, that's available for Windows, Mac OSX, Linux, Android and iPhone. 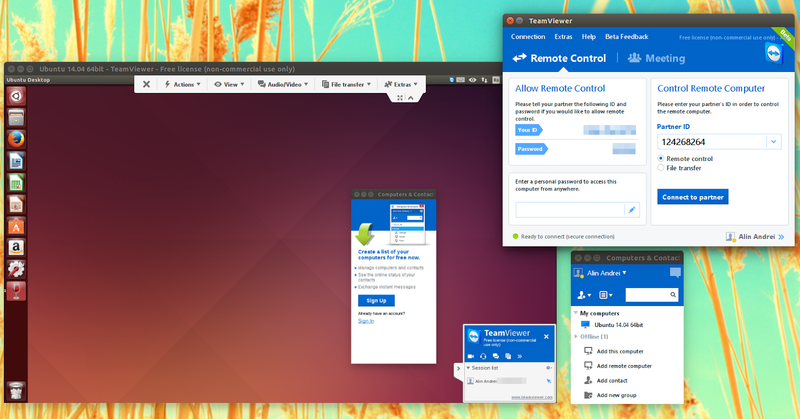 The application is free (freeware) for personal use and the Linux version uses Wine, which comes bundled with it (so users don't have to install Wine to be able to use TeamViewer). TeamViewer 10 was released recently and it comes with significant performance optimizations as well as new features, like Dropbox, Google Drive, OneDrive and Box integration, chat history and persistent chat groups, real-time session notes and more. Another interesting change available with the latest TeamViewer 10 is that Whiteboard is now available during remote control. Whiteboard is great for online training sessions and it can be used to select, underline, highlight, circle and more - kind of like what the popular Linux screenshot tool `Shutter` can do, but for screen sharing. various Mac OS X Yosemite improvements. Also, with this release, a TeamViewer BlackBerry app for remote control is available as a preview. 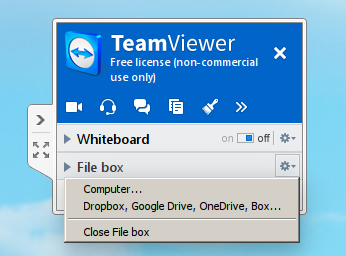 It's important to mention that TeamViewer 10 can establish connections to TeamViewer version 3 or higher however, older TeamViewer versions (9, 8, etc.) won't be able to connect to TeamViewer 10. Ubuntu 64bit: download and install the "32-Bit / 64-Bit Multiarch" package. Installing the 64bit package on Ubuntu 64bit won't work, because it depends on the "ia32-libs" package, which is no longer available in the official repositories for Ubuntu versions newer than 12.04.